The question for many scratch card players is: does the fun that comes with scratch card games extend beyond the thrill of suspenseful random chance into practical possibilities of winning? I’ll make no preconceptions about the moneymaking potential of this game. Instead, I am going to explore with objectivity whether or not you can win money as you play online scratch cards so that we can settle this debate question once and for all. I understand that some people want more than just a little bit of casino fun when playing this game – they want to win! But is this goal even worth pursuing? Let’s find out; no possibility is off the table as of yet. This would be the natural starting point for anyone curious to know whether a casino game is winnable or not. Wouldn’t you agree? After all, the house edge on any casino game, as you know by now, is a very reliable moneymaking tool for the casino. With some games, the house edge is so high that the attempt to win is pure futility and they believe in such a possibility a deluded fantasy. First of all, you have to understand that there are many ways to win with a scratch card game. Some wins are small, others average, and a few others monumental. The smaller wins have higher winning odds, and you can even expect to get a win with every three or so scratch cards you buy. 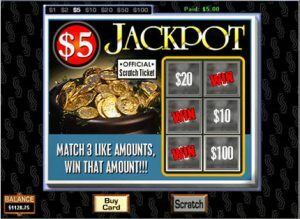 With the scratch card jackpots, your winning chances will be much lower, but if you manage to win the top prize, the losses you would have suffered along the way would have been worth it. In case you didn’t know, some scratch card top prizes have towered well above a MILLION DOLLARS. So Seriously, Can I REALLY Win? Based on the above analysis of scratch card winning odds, it is clear that the possibility of getting regular wins does exist with this game. And when you consider the potential payoffs that the jackpot prize has to offer, this is clearly a game that can make you quite a bit of cash. It is in fact quite a common occurrence for news outlets to feature scratch card winners who have managed to get life-changing payouts after spending very little money on scratch cards. It is also very common for scratch card players to take home up to $500,000 after getting a coveted symbol combination. If you have never played scratch card games before, don’t make the mistake of playing with real money right from the start. Although this game is simple, it also requires some experience, and it would be best if you did not lose your money in pursuit of this valuable experience. So, do some demo playing first before playing with real money. If you get a considerable win, don’t let is stay in the account. Leaving the money in your account is likely to make you reckless because you will feel like you are so far ahead of the casino that you can afford to take more risks. In fact, some people take a notable break after landing a big win. This helps them to keep a sober state of mind and prevents you from bleeding the money back to the house in hopes you can make a similarly big score. As explained in this scratch card winning guide, you should use a scratch card variant that is truly enjoyable to you. In this day and age, this should not be a problem. Online casinos offer lots of scratch card games to pick from, and a quick look at what each has to offer should tell you which game you will like more than all other choices available to you. It is important that you enjoy yourself as you play. As I mentioned earlier when discussing scratch card game odds, there are games that have pretty slim odds of winning. You will need your love for the game to keep going even when you have played quite a number of times without getting that elusive big win. After reading several stories of ordinary people whose lives were turned around by their scratch card jackpot wins, you head might be filled with delusions about this reward and make you decide to focus all your money and effort on it. This is not the way to do it. As you know, the odds of winning with this bet are quite low, and odds are that you will end up losing your entire bankroll while chasing after it. Therefore, you should play the jackpot cards in addition to regular bets. It is recommended that you spend only 10 to 20 percent of your money on the jackpot. The rest of the money should go towards regular scratch card bets. In addition to the above tips, there are other things you can do to better your chances of winning lucrative scratch card rewards. For instance, you should ensure that you get a bonus when you sign up with your chosen casino. Other than that, only use money you can afford to lose. Betting with money you should have used for something else hoping that the bet will payoff is a big mistake; and is usually the first sign that you might have a gambling problem. I’ll be brutally honest – winning the scratch card jackpot is usually a remote possibility, although it is also the most desired outcome for scratch card players. Fortunately, this is not the only way you can win with scratch cards. There are symbol combinations that offer pretty good chances of winning, although the wins are not as newsworthy. Still, you can try to win the jackpot using the strategy I have mentioned. But at the end of the day, remember that this is a game of chance. Don’t go in having any immoderate expectations about winning; you might be frustrated like many others have been.